The real news out of Jackson, Mississippi, last week wasn’t that a predominantly white church responded to the objections of white parishioners by turning away a black couple scheduled to be married there on the day before their wedding ceremony. We’ve seen this kind of southern ecumenical opprobrium before—most recently in Pike County, Kentucky, where the Gulnare Free Will Baptist Church voted to ban interracial couples from joining the congregation in 2011. And who can forget the 2009 case of the Louisiana justice of the peace who refused to issue a marriage license to an interracial couple? The familiar display of good ol’ rebel racism in the Mississippi capitol was nothing new. The real lesson there comes from the invisibly potent forces of denial and enabling, the twin pathologies that ensure that offenses like this keep happening, and will keep happening, in the pious Confederacy. Witness the supposed outrage from the “good” members of the First Baptist Church of Crystal Springs upon hearing the news that those poor black folk had been trundled off to exchange their sacred vows elsewhere. Someone please wake me when this rerun is over. During my two years of research for Better Off Without ’Em, I heard just this sort of denial of culpability restated over and over again. 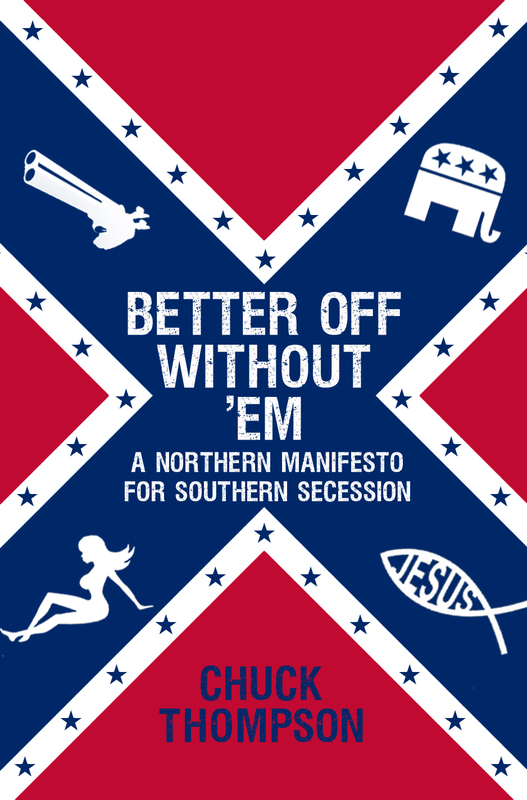 Talk with southerners about social issues and, while acknowledging the heavy burden of problems such as racism and religious intolerance, to a man, woman, and gun-toting child they’ll insist that they themselves do not embody those predictable characteristics and behaviors often used to portray the less attractive side of Dixie. We aren’t crazy religious—that’s just a small percentage of southerners who you’re thinking of. We aren’t racist—that’s just a small percentage of southerners who have a problem. We aren’t single-issue abortion voters or the ones who have a problem with gays—that’s just a small percentage of southerners who the media unfairly fixates on and uses to vilify the rest of us. All of these statements may be true. The majority of southerners are not loud-mouthed, uneducated, redneck fuckwits flying Confederate flags from the backs of their KIA and Mercedes lynch wagons. To what extent they were ever true many of these notions are comically outdated. 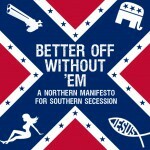 What the majority of southerners are, and have always been, however, is willing to allow the most strident, mouth-breathing “patriotic” firebrands among them to remain in control of their states’ most powerful and influential positions, be they in the realms of politics, business, education, or religion. Just as it was southern zealots who pushed the country into the Civil War, it was southern zealots who, while the rest of the South turned its back, were allowed to construct and maintain the legal foundations of Jim Crow; who were allowed to turn the Scopes Monkey Trial into a humiliating circus; who were allowed to circumvent Brown vs. Board of Education and school desegregation by calling out the National Guard and building segregation “academies”; who were allowed to resist Civil Rights with dogs and water cannons; who are still allowed to sidestep equitable school funding and proclaim without ridicule that a black president’s birth certificate is fake and throw secessionist balls and insist that slavery had nothing whatsoever to do with the Civil War, and swear that all of this was and is somehow being done in the name of a liberty to which they feel deprived due to their miserable lives of oppression and persecution beneath the stars and stripes. Maybe the fanatics do represent a minority of southerners. That’s still an extremely powerful group that the rest of the South enables—or succumbs to—or aligns with—or votes for—or prays alongside—year after year, decade after decade, century after century. As Jackson teaches us again this week, if there’s one thing about the South that hasn’t ever changed it’s the hypnotic influence of the crusader and zealot.